~~I know that I've been absent from my blog, but for very good reason. Last week we made a getaway escape to Walt Disney World in Orlando Florida. I didn't exactly feel comfortable putting it out on the world wide web that our home would be empty for a week so I wasn't able to share our fun news. ~~We've had the trip planned since the end of last year and I could hardly contain my excitement. It's been a dream of mine to take my children to Disney World since before I even had children, lol. Neither Dustin or I had ever been before so it was a trip full of brand new experiences for all of us. ~~The girls had so much fun that they pretty much exhausted themselves every day. They were the perfect age for Disney World; old enough to remember it all and young enough to still be completely caught up in the "magic." The look on Savannah's face when she met the Princesses is something I'll never forget. Both had so much fun filling up their autograph books with signatures from all the characters. 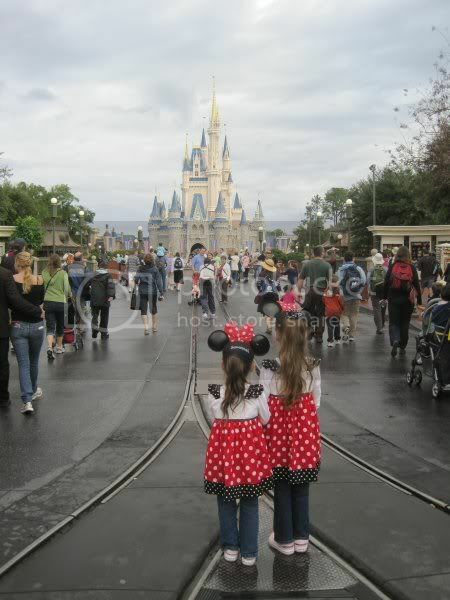 ~~When I first walked down Mainstreet towards the castle I got tears in my eyes. I couldn't believe that we were actually there. Magical really is the best word to describe that place, even for adults. ~~As you can imagine I have hundreds of pictures. I haven't even had a chance to sort through them yet. Don't worry, I won't try to share all of them. But hopefully I can post some of the highlights in the next few days. ~~This is one of my favorite pictures even though the air was damp and both girl have frizzy hair. (Only their Momma would notice that, lol.) It captures a little bit of that wonder. so glad you had a great trip. 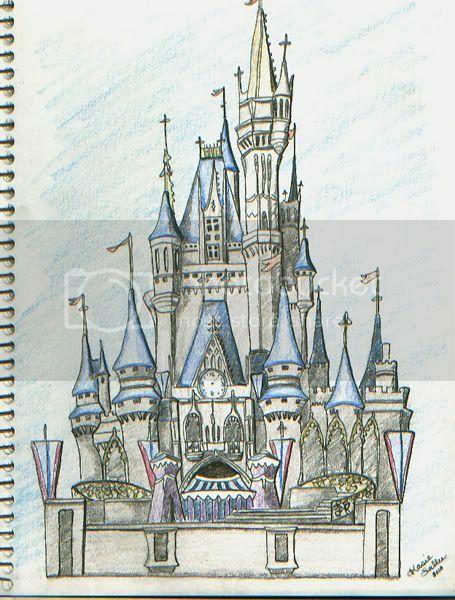 I LOVE your sketch of the castle, I would love a copy of that so special! hi!! I'm from Chile and I don't speak engligh very well but I need to tell you that I LOVED your blog, it's so magig and shiny!! I'm twenty years, and my fiance is my best friend, just like you and your husband. when I saw your blog, I've got the hope that my life could be very similar to your life, with my childrens and my boy. The best wishes for you and your job!! And thank you for visiting my blog Costanza. I appreciate your sweet comment! Amiable dispatch and this mail helped me alot in my college assignement. Thanks you for your information. What is UP with the blog spammers!! It's like my blog was attacked!